Passed over the 100 mark of unique visitors per day, and is increasing the average by about 5-10 per day, a very rapid growth pattern. This is unique persons and not HITS, hits mean nothing, or can mean How Idiots Test Success, I want to know how many unique people were on the page daily. 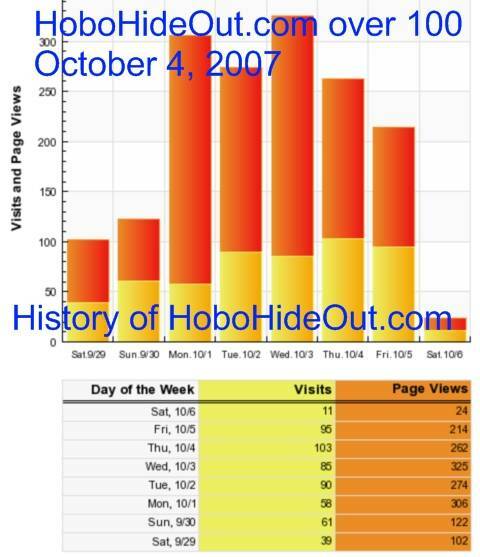 This is a graph as created by sitemeter.com, a small graphic that is on every page of HoboHideOut.com and creates an easy way to know the power of the page, the link is located on the bottom of all pages. Sitemeter.com sends me a daily report, this report is my constant reminder of failure or success, giving a feel and the tempo of the sites. A person need to know history to plan the future, there is a song in the world that can be heard.